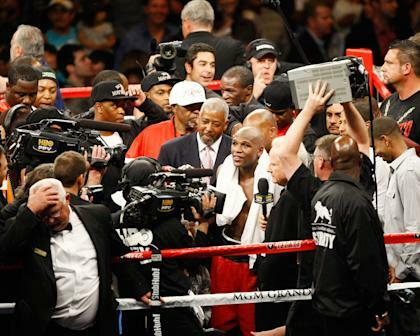 The most frequently asked question a boxing writer receives, aside from whether Floyd Mayweather Jr. will ever fight Manny Pacquiao, is "Who are those guys? If you're a boxing fan, you know the faces of Sam Watson, 58, and his sons, Brandon, 31, and Marcus, 28, even if you don't know their names or exactly what it is they do. Boxing publicist John Beyrooty, a one-time sports writer at the now-defunct Los Angeles Herald Examiner, calls them each '99'. It might seem an odd name, but as Beyrooty said, "When they're in a fighter's corner, he wins 99 percent of the time." The Watsons work for high-powered boxing adviser Al Haymon, a long-time friend of Sam Watson's. They are tasked with making life easier for Haymon's fighters, and tend to their every need, during camp and during fight week. Part of their job, they said, is to show their support for the fighter at all times. And so whenever one of their fighters is being introduced, or whenever he's being interviewed on HBO or Showtime following an event, the Watsons are sure to be in the background of the shot. Sam Watson began working for Motown Records years ago because he was a close friend of the late singer, Marvin Gaye. Gaye was a friend of Muhammad Ali's and introduced Watson to "The Greatest" late in Ali's career. A friendship between them quickly blossomed. "Marvin and I used to go over to Ali's house and we would want to talk boxing and he'd want to be talking music," Sam said. The job in promotions for Motown Records led to a meeting with Haymon, a concert promoter, in 1980. Watson and Haymon have been almost inseparable ever since. When the late Vernon Forrest hired Haymon as his boxing adviser in the late 1990s or early 2000s, Sam Watson immediately had a new job. Meeting Ali for the first time, though, was like meeting royalty, he said. With all the stars in sports and entertainment he's met through the years, Sam Watson said he only had that feeling twice. It had happened first when he met Ali and later when he met Mayweather Jr.
Brandon Watson joined the family business after retiring as a professional baseball player. He briefly made the majors with the Washington Nationals in 2005, hitting a home run in his first game. He was a superstar at the Triple-A level, but didn't get much of a chance in the majors. He hit .198 in 40 games with the Nationals and the Reds with one homer, seven RBIs and two steals in limited playing time. He had an International League-record 43-game hitting streak in 2007 while playing for the Columbus Clippers. He broke a 95-year-old league record set in 1912 by Jack Lelivelt of the Rochester Hustlers. "A lot of pitchers I got hits off of in that streaks, including guys who won 20 games, are in the majors," he said, sounding almost wistful. 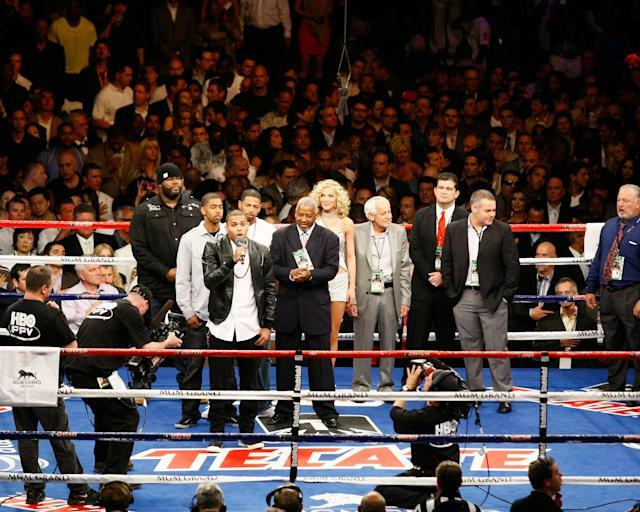 They're around stars all the time, in both boxing and music, but they've become mini-celebrities of their own accord among those who religiously watch boxing on television. It's almost like that old American Express ad campaign, "Do you know me?" Fans will see one of the Watsons and stare intently at them. The fan is positive he knows him, but can rarely place the name. "We get it every day, every single day," Brandon said. "At the dry cleaners, at the grocery store, gas station, wherever, people see us and recognize us now. It's funny and it's definitely humbling. We get that, though, because we want to create a family atmosphere with our fighters and people like to be around that family atmosphere. "Me and my Dad and my brother, we know we can't be beat, and when we get behind our fighters, supporting the Al Haymon team, they feel kind of invincible." The Watsons will get plenty of airtime on Saturday. Leo Santa Cruz defends his IBF bantamweight title agaisnt Alberto Guevara at the Los Angeles Sports Arena in a bout televised on CBS. 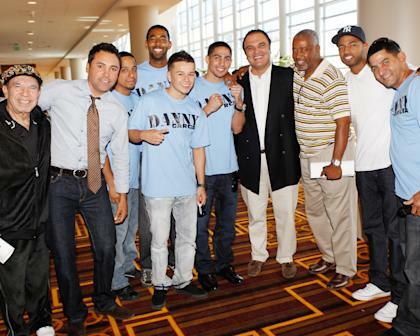 Later that night, they'll be with Alfredo Angulo when he fights Jorge Silva in the same building on Showtime. It's kind of a fan's dream job, working with and hanging around celebrities and getting to see the best fights on a regular basis. "I think the best way to say what our job is would be to say that 24/7/365, around the clock, we're there to take care of our fighters and whatever they need and whatever makes them comfortable," Marcus Watson said. "If it's something as small as getting in contact with someone at [equipment manufacturers] Everlast or Grant about something they need or being there for them in the ring, we do it. "If they need extra tickets for a show, we're on it. Airfare, we got that. Whatever it is, we do that to make their lives as easy and as stress-free as can be." 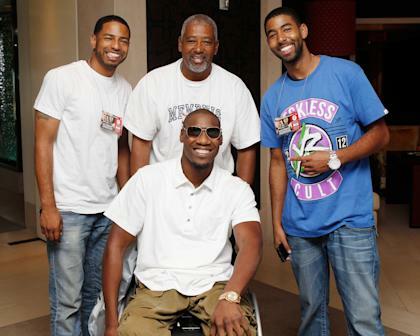 The Watsons also serve as unofficial talent scouts for Haymon, referring young fighters to him. 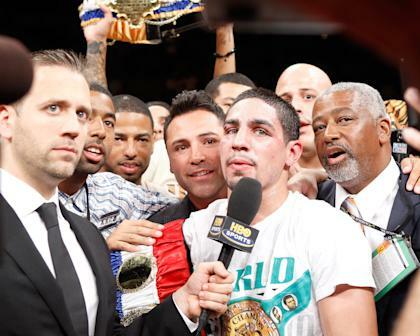 No matter what they do, however, they're always going to be known primarily among boxing fans as the guys in the back of the camera shot when fighters are on television. Sam Watson, who is ever the proud papa, says he can't imagine another life. "I get to work for an incredible man and a long-time friend in Al Haymon," Sam Watson said. "And I get to work with my sons all the time and do something I love doing. They're doing great. People say things about us and they don't know us, and say things about my kids. Some people say good things and some people say bad things; of course I want them to say good things about my sons. "When [the late Hall of Fame trainer] Emanuel Steward was real sick, I called him to see how he was. He said to me, 'You know, Sam. You've gone a great job with your sons. Jim Lampley and Max Kellerman and I are talking about Marcus all the time and what a great job he's doing.' That's the kind of thing, man, I can't tell you what that feels like as a father. And to be in this business and to be able to share this with my sons, it's really a special thing for me."